SHS Events — Spectrum Health Services, Inc.
National Health Center Week, from Aug 12th- 18th is an annual celebration with the goal of raising awareness about the mission and deeds of America’s health centers over the past five decades. 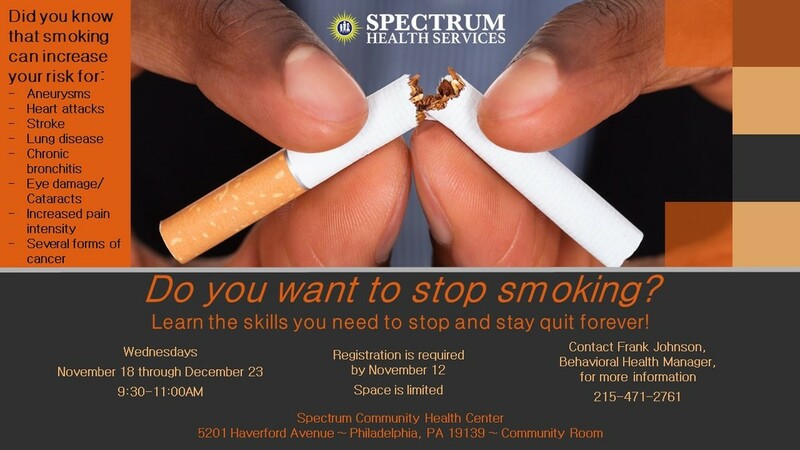 Spectrum Health Services, Inc. the umbrella organization of three federally qualified health centers in North, West, and South Philadelphia. Spectrum serves approximately 11,870 patients in Greater Philadelphia, a number that increases with the demand for affordable healthcare. Providing various medical, behavioral, and dental health services for all ages under one roof enables Spectrum to produce innovative solutions suited to each individual’s medical needs. 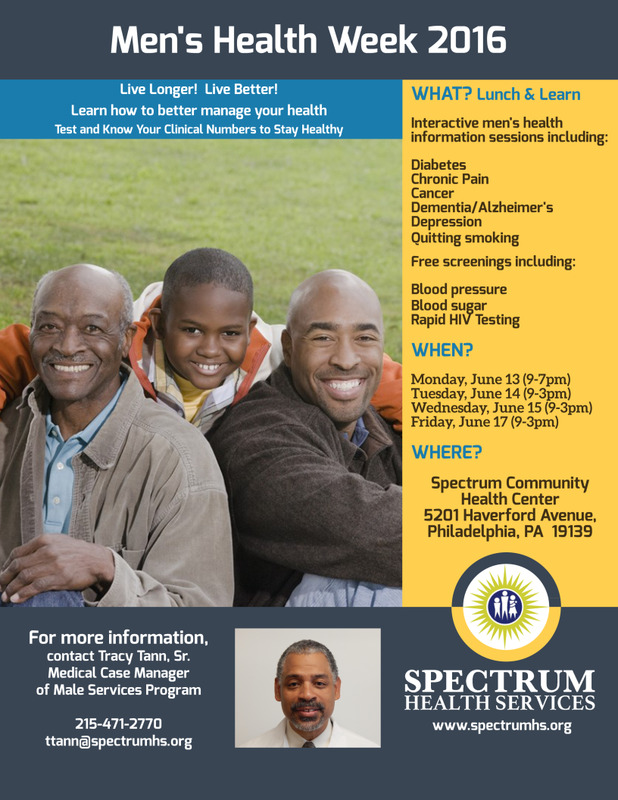 Spectrum will participate in National Health Center week by hosting FREE Wellness Meet n Greets between 12pm-4pm on Monday Aug. 13th at Reed Street Health Center (South Phila. ), Tuesday Aug. 14th at Spectrum Community Health Center (West Phila) Wednesday Aug. 15th at Reed Street Health Center (South Phila. ), Thu. Aug. 16th at Spectrum Community Health Center (West Phila. ), and Fri. Aug. 17th at Broad Street Health Center (North Phila). Spectrum cordially invites local businesses, managed care organizations, our community partners, our neighbors, and most importantly, our patients, to join us for these Wellness Meet n Greets to show appreciation to our staff for tirelessly providing medical care and to the community for entrusting us with all of your healthcare needs. Deliverance Evangelistic Church will be hosting a health walk and community health fair ripe with health screenings, gospel choirs, family-friendly activities and great food. 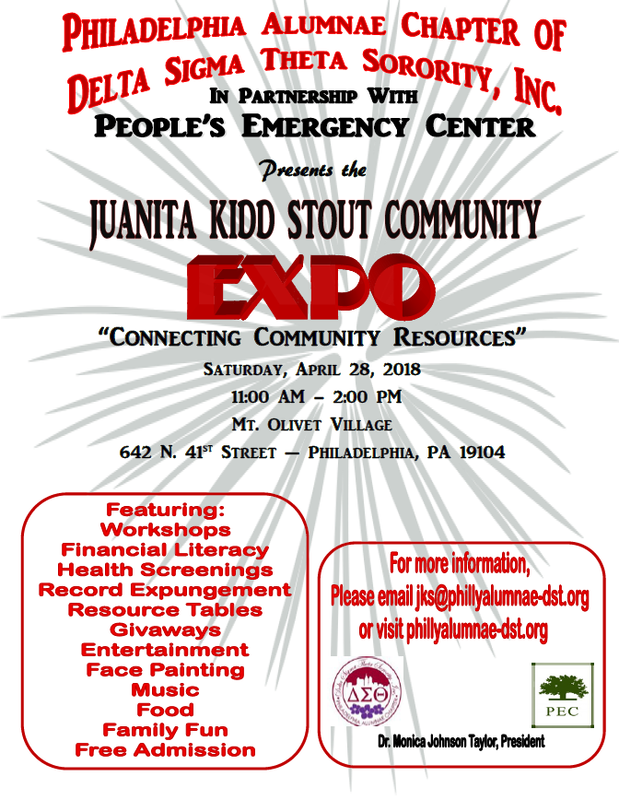 Philadelphia Alumnae Chapter of Delta Sigma Theta Sorority, Inc. in partnership with People's Emergency Center presents the Juanita Kidd Stout Community Expo! On Saturday April 21st from 9:30am-4pm, join the Schuykill Deanery of the Episcopal Diocese of Pennsylvania for a free, fun family-friendly day of healthy activities featuring U.S. Representative Dwight Evans and our esteemed dignitaries of Philadelphia at the Episcopal Cathedral on 23 S. 38th Street! Register here or log on to www.schuylkilldeanery.org for more info! The Alain Locke Community School, 4550 Haverford Ave. will be hosting a job fair for the 190th Legislative district presented by State Rep. Vanessa Lowery Brown, D-Phila., from 9 a.m. to 2 p.m. on Saturday, April 14. Companies and organizations will be onsite to provide various job openings and career opportunities. There will also be various sessions on business attire, interviewing and resume writing, and entrepreneurship. Open To Community Members in 19145 and 19146. Honorable Gwendolyn N. Bright, a judge on the Philadelphia County Court of Common Pleas in Pennsylvania and daughter of Bishop John D. Bright, founding member of predecessor organization Better Family Planning, honors Spectrum Health Services, Inc.’s 50th Anniversary coronation as one of the longest standing, Level-3 Federally Qualified Health Centers in Philadelphia on behalf of the Bright family. William H. Brown, Esq., Senior Counsel of Schnader Harrison Segal & Lewis LLP was a founding member of Better Family Planning’s Board of Directors, former Chairman of the U.S. Equal Employment Opportunity Commission, and Chairman of Philadelphia Special Investigation Commission investigating MOVE tragedy in 1985. To support Spectrum’s 50th Anniversary, Attorney Brown acknowledges his more than 55 years of experience and shares his memories of the onset of Better Family Planning. Sharmain Matlock-Turner, President and Chief Executive Officer of Urban Affairs Coalition and one of Spectrum’s 50 Community Gems this year, was unable to attend the gala but offers her congratulatory sentiments to her fellow community gems and to Spectrum for stellar programmatic and operational efforts. Healthy Hoops is a basketball-themed asthma management event for children and their parents. Event founder, the AmeriHealth Caritas Partnership, is dedicated to promoting and advancing health equity. Our health promotion and prevention programs address a range of chronic illnesses that are common among vulnerable and underserved populations. Spectrum Health Services, Inc. is dedicated to improving the lives of people living with high blood pressure through advocacy, awareness, education and support. Be a part of our hypertension support group. The Hypertension support group meeting will be on November 21st, 2016 between 4-6PM. • 11:15-11:45 am - What is a Physical Therapist? 12:00 pm - Keynote Speaker, Dr. Calvin Johnson, MPH "Live, Love and Know Your Numbers"
• 1:30-2:00 pm - What is a Physical Therapist? All women ages 40+ are invited to a mammogram screening this January! For more information contact a medical case manager at 215-471-2761. Communities are important because they allow people to interact with each other, share experiences, develop valued relationships and work towards a common goal. Without communities, people would have to live isolated lives with minimal or no contact outside their immediate circle. Getting to new people in your community is essential to the enrichment of your life. Learn the skills you need to stop and stay quit forever! Contact Frank Johnson, Behavioral Health Manager, for more information at 215-471-2761. Free Food, Games & Giveaways! FREE weekly classes including nutrition lessons, physical activity and hands-on cooking workshops! We also provide a variety of free resources to participants including booklets, handouts, coupons and food tastings. Participants will also be provided with a copy of each recipe so they may begin the process of building their own library of Affordable, Healthy, Easy, Accessible, and Delicious recipes (mirroring AUNI’s Think AHEAD Model) that can be built into a keepsake book to be used time and again. Healthy eating never tasted so good! For more information about the program or to get involved, contact Michelle Faulkner, RD LDN at 215-573-2380 or michellef@urbannutrition.org. Can I Get Your Health Numbers? Series 1: EAT. SMART. LIVE. STRONG. 5 Week Weight Loss Challenge Coming Soon! Ask to talk with Colleen Forrest, RDN, LDN or call 215-471-2761 Ext. 2690 to sign up and reserve your spot! Join us for a breastfeeding, child development, and reading workshop for expecting mothers and parents of children ages 1-5. Free book for all kids! Light refreshments will be served! Childcare provided! All women ages 40+ are invited to a mammogram screening this September! MONITORING: Get all the supplies you need to test your blood sugar and learn about healthy blood sugar levels. BEING ACTIVE: Learn some exercises you can do at home to help keep your bloods controlled. HEALTHY EATING: Tour a local farmer's market, attend a cooking class and receive $10 worth of FREE PRODUCE! TAKING MEDICATION: Learn or review how to properly take your Humalog/Insulin. AND MORE: Discover other self-care behaviors that can improve your diabetes health. 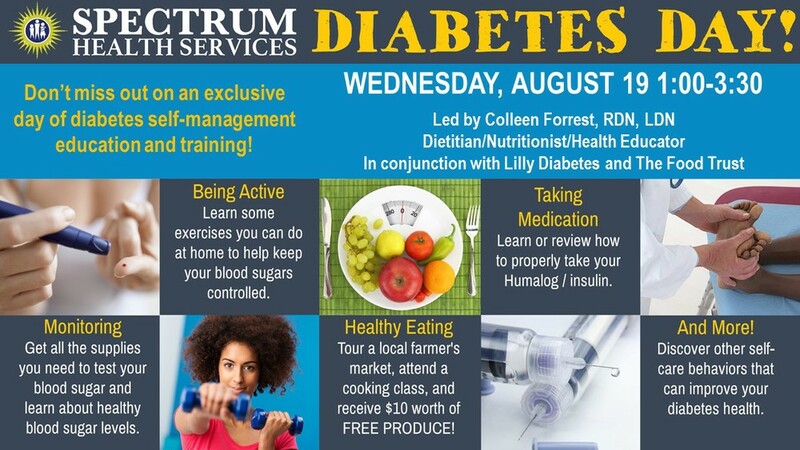 DON'T MISS OUT ON AN EXCLUSIVE DAY OF DIABETES SELF-MANAGEMENT EDUCATION AND TRAINING!